Great news! After a successful run in June, fodder is popping up again at Borough Wines & Beers in Essex Road, N1. Founded by chef Michael Thompson, and now also with Ollie Downey, fodder specilaised in seasonal, locally sourced food, and will be serving up a 7 course tasting menu for just £45, with paired beers and wines available to buy on the night. Its on every Thursday to Saturday from 7th - 30th September - hurry - this will sell out! "Following a successful three-night pop-up in June, fodder - the pop-up celebrating local, wild and seasonal ingredients and craftsmanship - returns to Borough Wines & Beers’ Brewery Below for a month-long residency with a whole new menu. Also new to fodder is Ollie Downey, who joins chef and co-founder Michael Thompson in the kitchen. The two chefs worked together at Fera at Claridge’s, and are coming together (along with co-founding team members Louise Stapley and Jenny Novitzky) to create what promises to be one of the most exciting menus currently on show in London. Since their June pop-up, they’ve been working hard to develop their network of independent, local suppliers and craftspeople to build upon the ethos and concept. Running Thursday, Friday and Saturday evenings from 7 - 30 September at Brewery Below, the nano-brewery and event space at Borough Wines’ Essex Road (Islington) shop, guests will enjoy seven courses of wild, seasonal, and locally-sourced food from the team for £45. Those who managed to secure a place at the June pop-up can look forward to an entirely new menu which showcases the transition of produce between seasons. Highlights include lamb​ ​nuggets,​ ​rosehip​ ​'ketchup'​ ​and​ ​fermented​ ​turnip​ ​'mayo',​ featuring foraged rosehips and lamb from The Butchery in Bermondsey, who work with native British breeds and small organic farms. 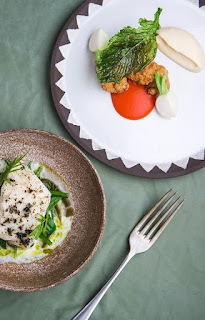 There’s also Cornish​ ​cod​ ​poached​ ​in​ ​seaweed​ ​with​ ​sea​ ​vegetables,​ ​buttermilk and​ ​apple​ ​marigold​, with cod from fishmongers Moxons, who work with day boats in Cornwall to source sustainable fish as well foraged sea vegetables. The pop-up runs alongside Urban​ ​Food​ ​Fortnight,​ ​an annual celebration of London’s best food and produce, which is helping to connect the team with top local and independent suppliers. fodder is also working with Hive & Keeper who collect honey in its natural state in a way that can be traced back to the the beekeeper, as well as Article Number 25, who grow mushrooms using the grounds from London coffee shops that would have otherwise gone to waste. Vegetables are coming from Good Earth Growers in Cornwall, an organic biodynamic farm who Ollie and Michael have worked with at Fera at Claridges. The Borough Wines-designed drinks menu features wines, beers and spirit serves chosen to complement the dishes and inspired by the menu's commitment to seasonality and wild produce. The wine flight, curated by Borough Wines founder Muriel Chatel, focuses on low-intervention natural and organic wines. The beer flight - by Brewery Below Head Brewer Tash Vine - showcases local producers and includes her limited edition ‘fodder’ brew, made using foraged ingredients."